Aliases: Crimson Dynamo roughly translates into Russian as "Krashni Denamit"
Powers/Abilities: The Crimson Dynamo armor granted Vanko superhuman strength and durability. It could generate massive electrical charges which could destroy electrical devices. Other inventions of Vanko's include the jet paralyzer, a gun which generated artificial magnetic fibers to snare a target in mid-air; the Dynamo Sputnik; a laser light pistol; and the Unicorn's power-horn weapon. Height: 5'8" (Dynamo Mark I) 5' 11"
Weight: 165 lbs. (Dynamo Mark I) 230 lbs. History: (Crimson Dynamo#5 (fb)) - Anton Vanko's work on low-loss electrical capacitors won him the assignment to work on the Krasnii Denamit project in Tomsk. The armor was already designed when he took over, but he went to work on designing the exoskeleton, and developed a satellite with a solar array to power the suit. He was assigned Alex Nevsky to assist him, but realized that Nevsky was KGB, and so shared as little with him as possible. Under Nevsky's nose, Vanko began work on a Mark II armor that would solve many of the first suit's problems. (Tales of Suspense I#56 (fb)) - Vanko also worked on the power-horn weapon for the Unicorn, which contained even more powerful weapons than those in the Crimson Dynamo armor. He wore the Crimson Dynamo armor to the demonstration of the Unicorn's powers. (Iron Man I#22 (fb)) - Nevsky and Vanko tested the Crimson Dynamo armor, and proved that it could resist the power of Iron Man's repulsor rays. It was now ready for a demonstration. (Tales of Suspense I#46) - Vanko was finally visited by his country's leader, who demanded to see a demonstration of his work. Vanko donned the Crimson Dynamo armor and destroyed a robot of Iron Man and a remote-controlled tank as demonstrations of the armor's powers. Fearing his power, the leader ordered him to journey to the United States and destroy Iron Man. Vanko was eager to test his armor's abilities in real combat. (Crimson Dynamo#5 (fb)) - Before departing, Vanko sent the Mark II armor to Arsenal Tomska to lie in storage until he could complete it. (Crimson Dynamo#4 (fb) - BTS) - On his last weekend in Russia, Vanko sent a package containing the Mark II's helmet into storage. He paid the janitor twenty dollars to keep it quiet. (Tales of Suspense I#46) - In the United States, Vanko caused a Stark Industries missile to fly off course so that Iron Man would intervene. In the days that followed he committed numerous other acts of sabotage at Stark Industries plants. Finally he went after Stark's own research center, and came face-to-face with Iron Man. Iron Man was able to resist the Crimson Dynamo's electrical powers with his force field. Iron Man utlimately provided the Crimson Dynamo with a recording supposedly from his leader in which he planned to have him killed. Furious, Vanko gave up his mission. Iron Man then asked him to defect to the U.S. and go to work for Tony Stark. Vanko agreed. (Crimson Dynamo#6 (fb) - BTS) - While he was at Stark Industries, Vanko finished the gauntlets needed to correct the excess energies in the Mark II armor. (Tales of Suspense I#52) - Vanko worked on a laser light weapon project at Stark Industries, wearing his armor for protection. He was nearly struck down while working in the lab, but Tony Stark came to his rescue, and suggested he add more lead to his armor for protection. 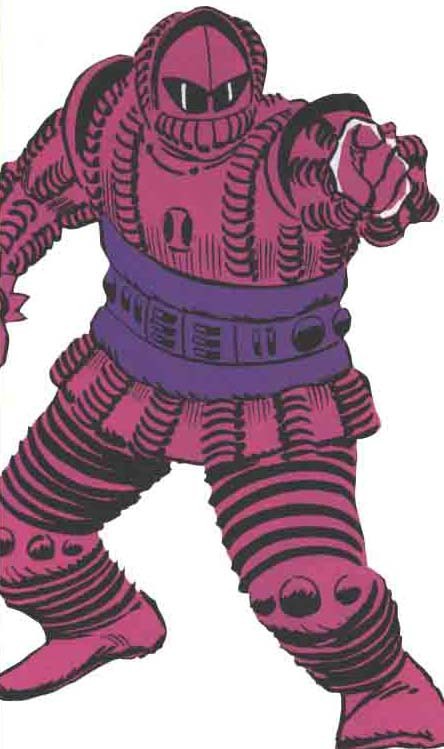 The Russians sent their agents Boris Turgenov and the Black Widow after Vanko, and Boris captured Vanko and donned the Crimson Dynamo armor to ruin Vanko's reputation. Iron Man set Vanko free, but was nearly brought down by Turgenov in combat. To save Iron Man, Vanko used his still-dangerous laser light weapon. The blast from the laser destroyed the Crimson Dynamo armor with a powerful explosion, killing both Vanko and Turgenov. Comments: Created by Stan Lee, Robert Bernstein and Don Heck. The leader seen in Tales of Suspense I#46 was Nikita Khrushchev, head of the Soviet Union from 1953-64. This is obviously a topical reference. 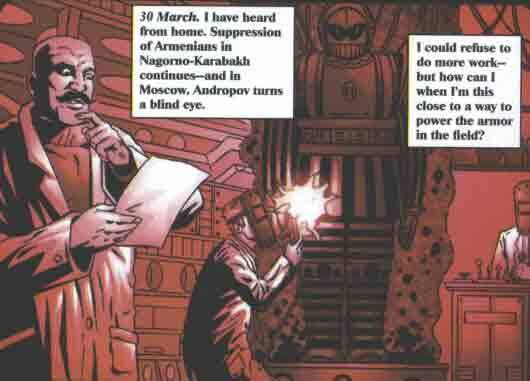 The flashbacks in Crimson Dynamo#5 are also full of topical references, as the Crimson Dynamo is said to have originally been a concept of Krushchev's in 1963; Vanko is said to have been given the assignment by Mikhail Suslov (aide to Leonid Brezhnev, who served from 1964-82), and later served under Yuri Andropov (1982-84) and Konstantin Chernenko (1984), among many other such references. At any rate, John Jackson Miller set up a timeline for Vanko taking about three years to complete the Crimson Dynamo armor, and set his first confrontation with Stark 20 years before the Crimson Dynamo series. Which also can't be right. Vanko has partial entries in OHotMU I#3, Deluxe Edition#3, Master Edition, Marvel Legacy: 1960s Handbook and the All-New OHotMU Update#2. The Dynamo Sputnik is a satellite with a solar array designed to power the Mark I and Mark II suits of Crimson Dynamo armor.